Also available with Standard Painted Model. The Paste Kettle is semi-spherical stainless steel jacked bowl (with glass insulation) having two shaft extensions in opposite direction, which are mounted in pedestal rail bearing blocks. On the shaft extension, the perfect manual tilting mechanism provided to collect the product by tilting the bowl. 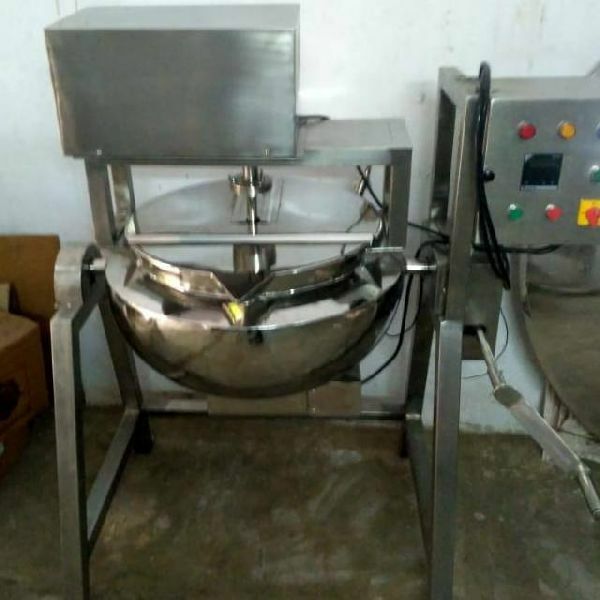 Water or suitable liquid is heated inside the paste kettle and after getting proper temperature by the liquid, starch or other binders added to prepare the proper paste & the same is used for further Granulation process equipment like Mass Mixer, RMG, FBD etc. Easy mounting & operation arrangement. Steam or Electrical heating system can be provided as per the end user ’s requirement. Depending upon the requirement, Centered Stirrer can be supplied with necessary worm reduction gear box coupled with electric motor with calculated speed. (OPTIONAL). Top Lid (loose type) provided considering safety. Inside surface of the Kettle is mirror polished & outside matt/mirror finish. The suitable operating panel also supplied with the equipment.